Before moving into the actual system and tools presented here, we felt it best to state some of our opinions and practices in terms of performing "readings" right up front. We often view readings within the context, of performance. We do not attempt to convert people into believing we have real psychic powers, which the spectators simply do not have themselves. We try and work within whatever belief system the client uses. Occasionally we set aside a moment in which we do strictly readings, with no hint of mentalism or magical performance. One such situation would be a booking agent who engages us to do readings as ENTERTAINMENT, at a party or special event. In this instance, we are usually one part of a larger entertainment program. While our approach to readings may be deemed radical in several ways, one outstanding feature is our presentation of readings within a magical or mental performance. We need not create an act of only readings per se. We often incorporate small readings into a card effect or rope routine for instance. Perhaps this seems impossible to you at the moment. We assure you it is not. In fact it can be vastly more entertaining than doing a reading or a trick by themselves. As you learn our use of the tools presented here and on the tapes, you will understand how a simple phrase such as "You're the kind of person that can get a quick grasp on what is needed, and you are not afraid to do so..." while dangling the end of a rope in front of a spectator, can be not only humorous - but also productive. Rarely have such approaches to readings been this easy and yet effectively entertaining. Wonder Readings may well inspire you to a new point of view on the subject of readings, and give you the freedom to do readings anytime, anywhere. Many of the tools presented here are being given to the world of magic and mentalism for the first time. Some of these tools others are already using - but they are not consciously aware of their use, or why they work. Other ideas we share represent long standing concepts we have kept to ourselves. Still others may exist in select groups unknown to most performers. But we are often on a search for the "ultimate" tools for magicians and mentalists. Once we have them, we cannot help but share this knowledge it seems. So it is with Wonder Readings. This journey began for Kenton in his renown "Wonder Words" series, and later with Kenton and J. Tank's systems "Completely Cold" and "SAR". All of these have been met with phenomenal acceptance within magic and mentalism. While "SAR" had a limited release, all of these projects have gained the status of "classics". Rex began training people from all over the world in the ways of powerful communication skills and how to understand and positively affect others. His reputation soon became so widely acknowledged, people demanded more and more of his time to learn from him. This left Rex less and less time to perform. Rex was quickly becoming a consultant to many celebrated people, and for a plethora of prestigious legal trials. But even with Rex's drastic schedules, he eventually made his way back into performing. Those of you who have witnessed Rex, and his rapport with an audience, understand his unique gifts. Rex has had success in both film and television. But it Rex's ability to connect with people, and to understand the workings of the human mind, for which he is most honored. Rex is one of the top providers in the training of NLP throughout the world. Rex also does performance coaching and consulting, as well as presentational skills training. You'll soon see why the demand for his talents is so great. The two of us have had ongoing conversations for years about how to create "perfect readings". While Rex was contributing some outstanding material for the final volume of Wonder Words, we agreed to join forces and focus on this issue of readings. We began exchanging ideas, tools and creative applications. We found new combinations of tools, and unusual practical applications. Soon we were able to make all of these methods simple and easy to use. Little or no memory was involved in many of the methods. No laborious facial or body reading cues. No long lessons on the skills usually required to use such tools as tarot cards or palmistry. No longwinded disclaimers. Methods were realized that could actually help a spectator without giving advice. The ability to do readings without any fear whatsoever clicked into place. Yet with all of these breakthroughs - a startling discovery: People who learned and used these tools often felt as if they might really be reading the thoughts of others! So is this REAL? We cannot say. We don't know. We could pretend to know, but that wouldn't be honest. What we do know is that these methods WORK. When doing readings, we always respect the laws of the land. As these may change from state to state, country to country, we always check to be sure that our way of doing readings is well within legal bounds. We suggest you do the same, or face possible dire consequences. If you follow our methods completely, you will find this to be of little problem. As we have stated, we often do readings within the context of entertainment and performances. While we do charge for performances, we do not necessarily charge for readings. This keeps us out of many legal scrapes. As Rex says "If you say to a friend, 'Perhaps you need to consider getting a different job' and your friend does that, you aren't in any legal trouble. But if your friend paid you a quarter to sit down with him and give your opinion, and then quit his job, YOU are now LIABLE if your friend goes broke. Your friend can sue you for taking your "advice". So keep this in mind. You do not have to give "advice". In fact we advise against giving advice. We suggest that at most you might make SUGGESTIONS to a client or spectator. Just be sure they understand these are SUGGESTIONS and NOT "advice", and that they must decide for themselves what to do in their OWN lives. After all, it is the spectator's life - not yours. Make sure clients understand this clearly. As you will come to understand, our tools do not demand that you make any such advice-driven suggestions at all. Never give legal, medical, therapeutic, or other professional advice in which you have no legitimate accreditation. Stick with the laws of the land. Respect what you do by respecting what others do in their chosen fields, and you should have no major difficulties. This does not mean that you cannot help others. We too are concerned about the well being of our clients or spectators. Our tools are meant to be used to do just this, if you are so inclined. Our belief is that if you wish to do readings at all, you should truly care about others. While we know that ANY tool of any type at all can be used both productively or destructively, we heartily condemn those who would use our methods in ways that take any negative advantage of a spectator. To those who desire only to accomplish fraudulent aims, we beg of you to reconsider. You can easily obtain all of the satisfaction you may wish by using these methods in positive and productive ways. The other path is one we choose not to take, as we are aware of the consequences. Even a fraud knows the consequences of his wrong doing, but thinks he will always wiggle out. If you are an outright fraud, history indicates that eventually you will likely sleep in the bed which you yourself have made. Please be aware that bed isn't exactly lined with satin sheets. We hope we have made our points clear in this regard of possible reckless behavior. There is no reason to do such things with the methods and applications we give to you. You will do as you will of course, but know what you are in for, if you abuse our suggestions. Naturally there is little we can say to those who believe readings in any form are wrong. From our experience, readings can be both entertaining and useful to a spectator. Sometimes readings may allow a spectator to talk to someone who will actually listen to them - a friendly, non-threatening ear. At other times spectators get an extra boost of confidence in their abilities to deal with whatever problems may face them. With our methods, it is sure that a spectator will receive POSITIVE "input". If negative messages are dangerous and damaging as some claim, then we feel readings are hardly society's main culprit. Of course we do not subscribe to negative readings of any sort. Yet what about the negative programming that takes place on a daily basis in what now makes up the "news"? How often are we humans bombarded with ghastly images and insidious "teasers", only to be told to "tune in tonight" to perhaps be saved from such tragedy. How often are we thrust into the negativity of others, by some company attempting to frighten us into purchasing a product! Is it possible to escape the criticisms of an increasingly cynical society, without some repercussions in our own minds? We are not suggesting that we are all unwitting victims of society. Unless defeated by severe medical or mental illness, each of us has the ability to allow or disallow various information into our own minds. The point we are making is that with all of the negative messages being tossed about in the world at large, we don't feel that it is harmful to give a spectator some POSITIVE input. From our point of view and our own personal experiences, we have found that we, as well as our spectators, are delighted to have an opportunity to share in an exchange of such positive messages for a change. We see many who only moments ago were tired and frazzled, become rejuvenated and full of life! We do not delude ourselves into thinking we have "cured" our "patient" - but we DO recognize that for a moment we may have made a positive impact on another person's life. This is a thrill for us that cutting four aces out of a deck, or proving we knew the headline of today's news, simply cannot match. In the end, this may well be only entertainment. How much can one possibly affect another by mere performance? If you have ever had a favorite song, a treasured novel, an unshakable memory from a film, we believe you have your answer. It is not only the upsetting messages one can find in entertainment that takes a foothold in our minds. Positive, pleasurable concepts take root there as well. So while this is a suggestion, we hope that you give our approach due consideration. We share with you the methods and tools we use to add positive messages to those we meet. Such things may not completely change a person's life, but we have noticed it may indeed have an important positive impact. When we ask spectators after a reading how they feel, the result is usually "Much better, thank you! ", "Ready to face the future whatever comes! ", "I feel wonderful!" and the like. We seldom experience such responses with standard magic or mental effects alone. It is such comments and reactions that cause us to feel that readings are indeed worthwhile to incorporate into our work. Readings in our usage may be nothing more at times than a comment to a friend. We do many "mini readings" over the phone, when standing in a line at a store, when approaching a sales clerk or server, when exchanging a greeting with someone on the street. You will discover how well our tools can be used in a wide variety of situations, and how these applications can empower the person you are speaking to, often with the result of better service, making new business contacts, or increasing your own business. Once you understand our methods, simply speaking to people may result in new attitudes and exhilarating conversations. You might scarcely be aware of the tools you are using in such cases - they become that natural that quickly. But you will probably notice a surprising sense of rapport with even complete strangers. It may seem as if you have taken a course in subtle charisma or "magnetic charm". When such experiences first happened to us, we too were in a state near to awe. Then we realized we had unconsciously been applying the very principles we set forth in Wonder Readings. This helped us to understand what happened, but rarely did this knowledge minimize our wonder. Such experiences and feelings continue to this day, as we are sure they will for you, when you apply these methods as we suggest. Some of our methods are in text form, while other tools may be found on the audio tapes. In some cases we will give you details of a method in both audio and text forms. We also cite examples of the use of these methods in audio and text. Text allows a more detailed intellectual study, while audio grants a sense of timing, flow and emotion. You will also be privy to a live reading on the audio tapes, and hear how a spectator herself responds to some of our methods. The Wonder Readings System is a system. It is a series of primary concepts and tools that when used together create awesome results. Yet as a system, it is quite unusual. Within the overall System are other original systems. The Wonder Readings System therefore is not a single system. The general "frame" to the System ties together the other systems within the main frame. The principles and concepts within the overall System are applied to the other systems. The factors that make for the overall System is what makes Wonder Readings a "system". Although systematic in nature and principle, our system gives you a wide variety of options. We encourage you and your clients to use a great many options, as you will discover. Our spectators in any magical or mental performance tend to be our personal clients, so we often use these words interchangeably. Exceptions may be in a restaurant setting or corporate function. In such cases it could be said that our clients are the restaurant itself, or the company for whom we work. But we feel it is a better frame of mind to see all of our various spectators as personal clients. After all if they are not happy, our sponsoring client isn't likely to be happy either. So we view everyone in such light. We mention this to avoid any confusion with the term "client". We do NOT mean to use the term "client" in any therapeutic sense. Unless you are a certified therapist, don't think that you are one - and don't act like it either! While on the tapes we speak of "clients", please understand we refer to these people just as we would in any of our other performance work. It is NOT meant as a therapeutic or medical term. Make 4 pacing statements followed by 1 leading statement. Next make 3 pacing statements followed by 2 leading statements. Continue by making 2 pacing statements followed by 3 leading ones. Finish by making 1 pacing statement followed by 4 leading statements. "So you're Bill (1) I'm Kenton (2) and we're sitting here (3) ready to do some sort of reading so (4) you can learn more about your own potential future (L1)." "You might be wondering how we'll go about this (1), what it will be like (2), or what I might tell you (3)... I will tell you what I truly see (L1) and how you can use these things to make your life better (L2)." "Some readers tell you only what you want to hear (1) and others are just sort of vague (2)... I'm going to be truthful with you (L1). I will discuss your very real abilities (L2). 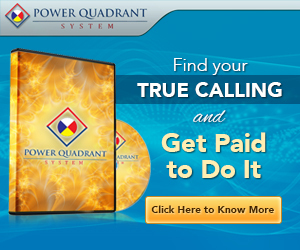 I will explain how you can use these things to create a better future for yourself (L3)." 'True, some people are at first skeptical (1). You will see that what I say makes good sense. (L1). You will find that my only purpose is to truly help you (L2) and provide useful information to you (L3). By the time we finish, you will know what you need to do to make your life better (L4)." "As you hold out your hand (1) I just support your hand with mine (2) as I look into your palm (3) and gently pull it a bit closer to me (4) to see where you have had some issues with control (L1)." "Everyone needs a certain amount of control (1). Some people carry their desire to control too far (2). Others need to quit giving up so much control over their lives to other people (3). I see where you feel things are just out of control (L1). I see where you feel parts of your past actions are now controlling you (L2)." "No one is in complete control all the time (1). Some people swear they have little or no control at all over some things (2). But you do have control over how you choose to live your life (L1). You do have control over honestly dealing with your past (L2) and then letting go (L3) because the past is the past after all !" "You can't change what happened in your past (1). You can take responsibility for your past actions regardless of what anyone else said or did (L1). You can do what it takes to do things differently from now on (L2). That changes everything (L3) including how you can see your past as an incredibly valuable tool that you are grateful to be able to use now (L4)." "What is past is past (1). The future isn't here yet (2). The only time you can ever take an action is in the present moment (3), and that time is now (4). Now you can look over your past to help you see what has been out of control (L1)." "Everyone has some area of their life that feels out of control sometimes (1). Some people have less problem areas than others (2). But we all have such feelings from time to time (3). Your past provides clues for you here (L1). You can see how past patterns repeatedly occur in this control area (L2)." "If you do the same thing over and over again, you'll get the same sort of results (1). When you change, your life must change in some way (2). It's time for you to make some decisions about how you want your life to be (L1). You need to take responsibility for your part in these situations (L2). Then you need to make the correct changes in your own life (L3)." "You can only change yourself (1). You already know what changes you need to make now (L1). You know what paths you really should not take (L2). You can see honestly what you need to admit to yourself (L3). So take what you know is the right action, to regain proper and balanced control in your life now ! (LA)"
We might finish this with a closed-ended question such as "Will you do that now?". At first you may wonder how you're going to keep track of how many pacing and leading segments you need to do as you continue to speak. Recall that each cycle is divided into a total of FIVE parts. Interestingly, that's the same number of fingers many people have on one of their hands. You might allow one of your own hands to casually drop to your side. Extend four fingers to begin, to represent the four pacing statements. This leaves your thumb "tucked away". Just consider the extended fingers are your pacing statements, the folded in fingers as your number of leading statements. You can casually wiggle each extended finger as you go through each statement. When you run out of fingers, your folded thumb reminds you to do ONE leading statement. Thus ends "the first cycle. Every time you begin a new cycle, you tuck one finger away. So now you have three fingers extended, which means you do three pacing statements. After that you go to your folded fingers and do that many leading statements. Then you begin again, and tuck away another finger as you continue. Try it and you'll see just how easy it is to keep track in this manner. Or you might wish to get really bold if you are reading palms, and touch a new finger on the client for each cycle to secretly help you keep track! "You have a line here (1) that crosses right here (2) this line intersecting it (3) leading up to a different line here (4) that indicates mental focus (L1)". Just continue using the formula and pacing the spectator with lines, hand shape, finger length, etc. 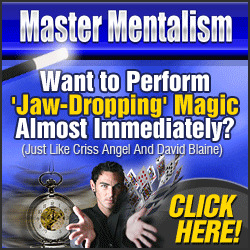 You'll find this a very easy and ingenious way to do palm readings. We shall hint no more at this incredible application. With a bit of practice, you'll discover you do not need to stick to this formula exactly. We often begin using the formula to establish ourselves with the spectator, and once we know we have good rapport, we shift to leading statements. In such instances, we only pace the spectator again when we feel that we may be losing rapport. A few simple pacing statements uttered, we generally find we can then lead again without concern. Even if you know nothing about palm reading, this technique combined with your own observations and impressions, can allow you to be perceived as quite knowledgeable. You might be touching the spectator's hands to get impressions. You may be reading the spectator's natural energy. In other words, don't get stuck on having to do palm readings per se. As we say on the tapes, there are a great many ways to apply this kind of "pacing and leading" tool. Don't limit yourself! Rex paces and leads almost everything. It isn't difficult once you know how. We'll look at a different kind of pacing and leading tool next. The principle is simply this: We have someone do something simple. We do this a few times, making what the spectator does progressively - but slowly - more involved. This subtly leads the spectator into committing to the reading's success. Because the spectator has had to do certain things, there must be a good REASON for them to have done this -unless the spectator is "crazy". At this stage of the game the spectator is unlikely to dispute you, because that would mean what they had just done previously was stupid. No one wants to be called stupid. No one wants to be considered truly crazy. But that's how we all tend to feel UNLESS we go along with the reason given, for having done what we have done. We either have to admit to ourselves and to others that we have done something stupid - and therefore might BE stupid - or we continue to go along with what has already been set into motion. This principle is sometimes referred to as the "Commitment" or "Consistency" principle. To help you apply this method, we will give to you a full blown system you can use right away. Best of all, you can do this reading on your own business card - which the spectator of course is likely to keep! Hand the spectator a pen and have them write the numbers 1,2,3,4, and 5 on the back of your business card. If they ask, tell them to write the numbers any way they want to write them. This helps pace them and allows the spectator to know you are being fair. It also gives the spectator a sense of freedom, while you are "setting the stage". When a spectator asks such a question, allowing them to exercise their own options creates more rapport. When they have finished writing the numbers you will move right along, as the process has already begun. They have already complied with your first request. Don't tell them this, however! Next have the spectator circle their favorite number of these five. This of course is another secret compliance on their part. Whatever number they circle, nod and say "Excellent!" or "Very good!". This builds up rapport and more likely compliance. Have the spectator circle a second number - what they feel is their second favorite number. Make another remark such as "Perfect!" or "Wonderful!". The spectator may ask what you mean. Say that you'll tell them all about WHAT THEY HAVE DONE once they finish. "You probably don't do that everyday - writing down numbers and circling or underlining a number - unless you have a good reason, of course...!" "... Of course there's a reason, otherwise this would be CRAZY! And you don't strike me as crazy...".